PFA UNDER 13 FINAL: Hampton kids prefer to win at the ABAX than the Nou Camp! Rio Smith celebrates his goal for Hampton Under 13s against Alconbury in the PFA Cup Final at the ABAX Stadium. Hampton Under 13s emerged from a season of heartbreak to lift the PFA Cup at Peterborough United’s ABAX Stadium (May 19). The city lads beat fierce rivals Alconbury 3-1 in the final to avenge two cruel defeats at the hands of the same opposition earlier in the season. Hampton Under 13s with the PFA Cup. 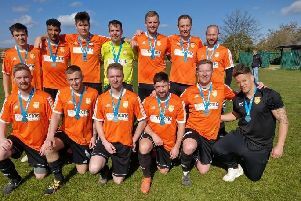 Alconbury had beaten Hampton on penalties in the final of the Peterborough & District Junior Alliance League Cup and pipped them to the Division One title on the last day of the season (May 15). Hampton needed to win their final game at Werrington to force a title play-off, but lost 1-0. “We’ve suffered a lot of heartache this season,” Hampton manager Jamie McLaughlin admitted. “The League Cup Final defeat was hard to take and the ball just wouldn’t go in the back of the net for us at Werrington. “But it was exactly the opposite at the ABAX as the lads bounced back brilliantly. It was a great end to the season for us. It doesn’t get a lot better than winning a final at the ABAX. Luke Scampion was the two-goal star of the win over Alconbury, although goalkeeper Matthew Wells was named man-of-the-match for his superb display. Scampion opened the scoring after three minutes and was on hand to tap home after a terrific strike from substitute Rio Smith had come back off the crossbar on 25 minutes. That was Smith’s first touch of the ball and he completed the scoring himself with an excellent finish 20 minutes from time. Alconbury had pulled a goal back on the stroke of half-time through Harrison Radwell.